Председатель: А.П. Лосюков, президент НРК. Председатель: И.А. Герасимова, д.филос.н., профессор. «Творческое наследие Е.И. Рерих и его роль в развитии науки и культуры. Бондаренко А.А., директор МИСР, член Совета попечителей Международного мемориального треста Рерихов, к.ф.-м.н. Штогрина Е.Н., учитель МБОУ «Основная общеобразовательная школа № 24» г. Новокузнецк, к.пед.н. 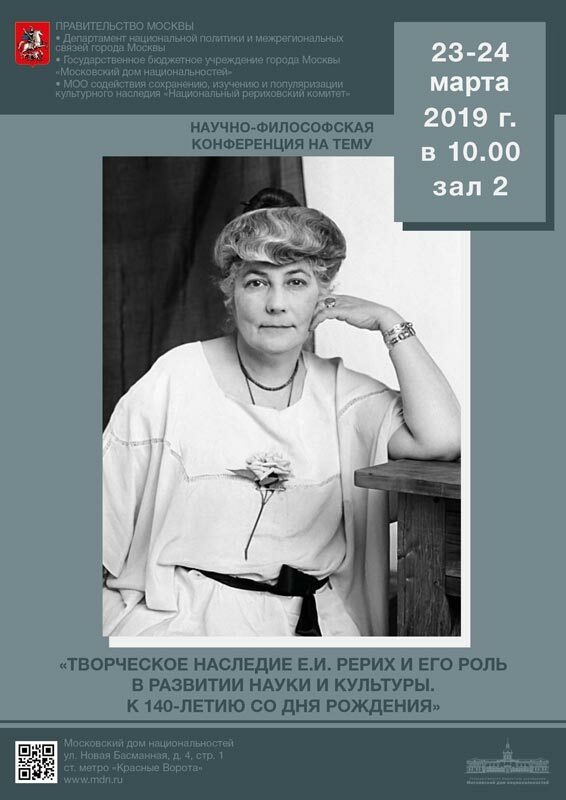 Бикалова Н.А., Агешин Ю.А. (приветствие по поручению президиума Международной ассоциации «Мир через Культуру», зачитывает Н.А. Тоотс), Логинова К.Ю., Саполева С.Ю., Малов И.Ф., Гиндилис Л.М., Хмуркин Г.Г., Чирятьев М.Н., Кайдорина З.А., Красносельский С.Я., Ключников С.Ю., др. International Charitable Foundation "Roerichs Heritage"
Chairman: Alexander Losyukov, NRC President. Members: Alexei Bondarenko, Vladimir Chernyavsky, Natalya Dmitrieva, Nikolai Makarenko, Vladimir Melnikov, Vladimir Nadezhin, Yelena Rodionova, Egor Turley, Victor Zhigota. Chairperson: Professor Irina Gerasimova, DSc, PhD. Deputy Chairperson: Alla Shustova, PhD. Members: Vladimir Budanov, Mikhail Chiriatev, Lev Gindilis, Andrey Ivanov, Dmitry Popov, Natalia Toots. "A Yogi Who Strove for a Better Future for Humanity"
"Urusvati as Helena Roerich’s Peak in Altai"
"The Significance of the Oriental Spiritual Thought in the Work of Helena Roerich"
"Hints from Living Ethics on the Philosophy of the Future"
"The Culture of Cosmic Consciousness, the Metaphysics of Unitotality and the Works of Helena Roerich"
"The First Group of Followers of the Living Ethics Teaching in Russia"
"Helena Roerich as a Symbol of Ultramundane Wisdom in Texts by G. Roerich"
"Images of Helena Roerich in the Artwork of Nicholas Roerich"
"Footsteps of Spirit and Scenario of Life: the Biography of Helena Roerich through the Eyes of a Psychologist"
"Life’s Journey of Helena Roerich in the Light of the Philosophy of the “Eternal Feminine”"
"Living Ethics and Anthropological Issues of the New Technological Paradigm"
"The Unity of Science and Art as a Strategy of Salvation"
"Methodological Foundations of Future Science in the Works of Helena Roerich"
"Health Philosophy in Helena Roerich's Writings and Challenging Problems of Medical Practice Integration"
"A View on Healing from the Perspective of Contemporary Science and the Teaching of Living Ethics"
"On the Importance of Psychic Energy in the Treatment of Disease"
"Suggestion, its Characteristics and Role in Medicine"
"Methods of Ancient Ayurveda in Modern Medical Practice"
"Difficulties in Translating Some of the Basic Notions of Living Ethics (the Terms “Straight-knowledge”, “Achievement”, “Striving”, “Leader”, etc.) into Foreign Languages and Ways to Overcome Them"
"On the Structure and Completeness of Helena Roerich's Records Archive"
"Perception Problems of Helena Roerich's 1949-1955 Diary Text Records"
"The Teaching of Living Ethics and Important Problems of Modernity"
Address: 4/1 Novaya Basmannaya st., Moscow, Russia.